I‘ve been under a lot of stress for the past few weeks. And it’s not one of those self-made stress, mind youâ€”but genuine, work-related stress. I don’t like worrying about things I really shouldn’t worry about, but work has a way of doing that to youâ€”especially when you’re talking about deadlines. Unfortunately, with my kind of work, it’s really important to have a level of relaxationâ€”else, inspiration would be a pain. My husband and I have recently been to a spa village in Tagaytay (just last Sunday, to be more precise). I can honestly say that the relaxation and pampering did wonders for meâ€”less stress, more work. Ideally, it would be best to take a break at least once a month, but driving all the way to Tagaytay from Antipolo on a regular basis is insaneâ€”not to mention an unnecessary waste of gasoline. Good thing I recently found out about a new branch of Blue Water Day Spa opening in Capitol Hills, Quezon City. This Blue Water Day Spa branch is nestled within the sprawling fields of Captiol Hills Golf and Country Club, giving customers an excellent scenic view of the metro. A definite plus, in my opinion. 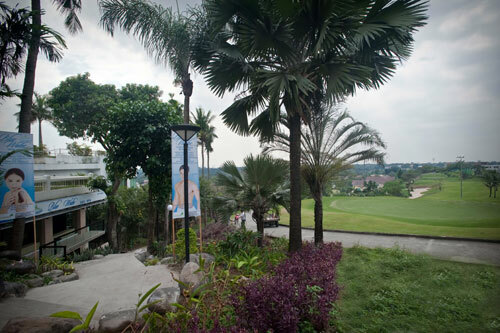 Because for me, scenic views like the sprawling fields of the golf course, add to the feeling of rest and relaxation, which is one of the reasons why my husband and I make an effort to take the long journey to Tagaytay for spas. I haven’t tried this branch of Blue Water Day Spa yet, but I think Marc and I will during one of our “relaxation” days. It’s not very often that you get to have a day of pampering at a spa and at the same time, have an excellent view to enjoy. I’d probably try the Traditional Filipino Massage a try — two hours of relaxation bliss — and bring my tripod to boot. No, I’m not going to use the tripod during therapy, but I have a feeling it’s going to come in handy when the sun sets — perfect for a photo shoot. This blog post is my official entry to BlueWater Day Spa Capitol Hills: 20 Bloggers Event Competition. This entry was posted on Tuesday, 21 April 2009 at 11:28 pm and is filed under Contests. It is good to take a break from your work whenever you can. Fortunately I am bringing my family to Hong Kong this week! awesome! out of town trips are truly relaxing..
Nice shot you got there. It isn’t hard to believe that you got the relaxation that you needed. Heading for the spa is most likely a place to be after working for long hours. That looks like one of the most relaxing places in the world to be. The scenery is great.